Haq's Musings: India-Pakistan Ties: Who's at Fault For Failing to Resolve Disputes? India-Pakistan Ties: Who's at Fault For Failing to Resolve Disputes? India's former foreign secretary Shyam Saran is the latest of a series of ex Indian officials to reveal causes of failures to resolve disputes in India-Pakistan talks in the last two decades. Mr. Saran was part of the process to resolve Siachin and Sir Creek disputes regarded as "low-hanging fruit". Similar revelations have been made earlier by former Indian RAW chief A.S. Dulat about the last minute interventions by Indian Deputy Prime Minister LK Advani that resulted in the failure of the Agra Summit between former Pakistan President Musharraf and ex Indian Prime Minister Vajpayee. In “How India Sees the World: Kautilya to the 21st Century”, the author Saran recalls the crucial meeting of the CCS (Cabinet Committee on Security) on the eve of India-Pakistan Defense Secretary-level talks in May 2006, where the draft agreement, that had been approved by the Army and other stakeholders, was to be discussed. However, he said two key players, the-then National Security Advisor MK Narayanan and then Army Chief General J.J. Singh made last minute interventions to scuttle the proposal, according to a report in The Hindu newspaper. Revelations by Dulat and Saran have debunked the myth promoted by Indian security analysts, Indian politicians and some western think tanks that regularly blame Pakistan for the failure of past bilateral diplomatic efforts by citing what they believe is the adverse role of Pakistani military in framing Pakistan's policy toward India. This rationale does not explain why the diplomatic initiatives undertaken by Pakistani military leaders from General Zia to General Musharraf have not borne fruit. A more rational explanation for the policy failures has surfaced in secret US embassy cables leaked by Wikileaks and published by The Hindu. After a meeting with India's National Security Adviser and former Indian intelligence chief M.K. Narayanan in August 2009, American Ambassador Timothy Roemer concluded that Prime Minister Manmohan Singh was isolated within his own government in his “great belief” in talks and negotiations with Pakistan. That is of course, your contrived viewpoint. It will work for your audience because that is what they want to hear. I don't think a contrary opinion has space on your site or does it? India negotiates from a position of strength. Anon: "India negotiates from a position of strength." It's an Indian delusion that prevents reaching peace in the neighborhood. It's the reason for "India at risk" in the words of ex FM Jaswant Singh. Singh says "India's borders remain unsettled" since independence and Indian policy suffers from "strategic confinement". Army chief General Bipin Rawat on Saturday said neither China nor Pakistan is an imminent threat to the country in a departure from his earlier statement wherein he had dubbed the two neighbours India’s northern and western adversaries respectively and that the country needed to be prepared for a two-front war. “None of the country (China or Pakistan) is a threat,” he said on the sidelines of an event in Uttarakhand’s capital Dehradun on Saturday noon in response to a query. “What I had said... said,” he went on to add when reminded of his previous remarks made a little over a week after India and China ended one of their worst military face-offs at Doklam at the India-Bhutan-China tri-junction. China had reacted to Rawat’s earlier remark, saying ties between the two countries should not be derailed. Against the backdrop of Doklam standoff, the general said, army was extra vigilant at the borders and the security forces were taking appropriate action in the “sensitive areas”. But at the same breath he added, army was keeping its option open for “surgical strikes”. Kashmir has been witnessing violent protests and clashes since the death of Hizbul Mujahideen commander Burhan Wani last year in July. General Rawat was in Dehradun to attend annual function at Cambrian Hall, his alma mater. The army chief, who hails from Pauri, studied at Dehradun’s Convent of Jesus and Mary (CJM) till Class 2. Thereafter, he studied at Cambrian Hall between 1969 till 1972 and then did his senior schooling at St. Edward’s School, Shimla. “I have spent my most memorable days in this school,” he said during the event, dressed in a navy-blue blazer with the school monogram engraved. He also made special mention of his teacher Shanti Swaroop, who was school coordinator at that time. Gen touched Swaroop’s feet as a mark of respect and love. “Your neighbour is your natural enemy and the neighbour’s neighbour is your friend”. This was the basic thought behind Kautilya’s Mandala Theory. and next to that a friendly state (friend of a friendly state) and so on. However he also recognized the existence of neutral and mediating states. alliances that are later found to be disadvantageous." "Your neighbour is your natural enemy and the neighbour's neighbour is your friend" this was the basic thought behind Kautilya's Mandala theory. Kautilya gave this theory for foreign relations and diplomacy. 1. Peace: “The only time a king will make peace is when he finds himself in relative decline compared to his enemy”. If we analyse this dictum then we will understand that after the 1962 humiliating defeat from China, India established peace with China, because it knew that it cannot win against China. This is a clear indication of the Kautilya’s six fold policy. India is still following Kautilya’s policies to safeguard its interests and defeat its enemies. 2. War: “When a king is in a superior position compared to his enemy, he will attack and wage war.” India has always tried to subdue Pakistan. It’s clear from its current military formation. Indian II- Corps, also known as the Strike Corps, plays a key role in times of conflict with Pakistan. The II Corps holds almost 50 per cent of the Indian strike capabilities and although based at Ambala it is responsible for guarding the border with Pakistan and mainly it is Pakistan focused. India has tried to coerce Pakistan many times in the past. In January 1987, India and Pakistan nearly went to war during a major crisis accelerated by India’s Brass tacks exercises, the largest military maneuvers in the history of South Asia. A tense situation developed in which even a minor clash could have triggered a major conflict. But diplomatic activity brought in the United States and the Soviet Union. President Reagan at that time telephoned Rajiv Gandhi and President Zia, instructing them to “cool it. The threat of nuclear escalation defused the tension. Then in 2001 a terrorist attack on Indian parliament brought both India and Pakistan on the brink of war. Estimated 800,000 troops, including its two strike corps, deployed on India’s western borders, its Air force units and satellite airfields were activated and the fleet moved into northern Arabian Sea to join the western fleet for blockading Pakistan if required. Various reasons were cited behind the Indian action, including the use of coercive diplomacy to mount international pressure on Pakistan. In an expected manner, Pakistan undertook large-scale counter deployments of its troops leading to an eyeball-to-eyeball confrontation along the border, which carried the danger of conflict being escalated into nuclear war, not by design, but by misperception, accident, or miscalculation. 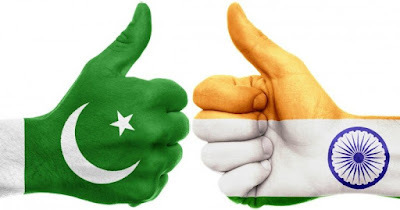 These two events shows Indian aggressive designs against Pakistan, but due to an effective response from Pakistan Indian could not impose a war on Pakistan. Chankaya Kautilya in his book also mentioned three types of war first is open war: In which, it is a declared war against a country. Second is a secret war which entails “a sudden attack, terrorizing from one side and attack from another side”. India is effectively pursuing this dictum. India is actively involved in Afghanistan making things worse for Pakistan in Balochistan and FATA. On the other hand it is practicing its Cold Start Doctrine on eastern border to coerce Pakistan. Now Pakistan is facing two front war dilemma from Eastern and Western border. Kautilya support such warfare in his six fold policy. Third is “Undeclared War: Which includes secret agents, religion or superstition, and women against the enemies” India has already waged such war against Pakistan. Pakistan has always criticised India’s malicious involvement in Balochistan and tribal areas of Pakistan. India is also involved in the malicious activities against other neighbouring countries including Srilanka (supporting Hindu Tamils), Nepal, (supporting Maoists Separatists), Bangladesh (supporting Shanti Bahini in Chittagong hills). All these malevolent activities suggest that India is keenly following the Kautilya’s policy to intimidate its neighbours. The former spymaster stated that whatever is happening in Valley after 2016, is an aberration and gun was neither the solution in 1990 nor it is the solution in 2018. “The story of Pakistan is over in Kashmir. What has happened post 2016 is again an invitation to Pakistan, because of which they are having free extra ride here.
. Durrani and Dulat’s book, “Spy Chronicles: RAW, ISI and the Illusion of Peace” has garnered enormous scrutiny on both sides of the fence. There are other valuable nuggets for watchers of a region that President Bill Clinton once called “a nuclear flash point.” Dulat shared how a border cease-fire was brokered in 2003 as a result of secret meetings between the head spooks of either side. He revealed that a tipoff from RAW saved the life of former Pakistan president Pervez Musharraf and said Musharraf had even conveyed his gratitude.